PULLMAN, Wash. – President Kirk Schulz will confer degrees to about 850 students expected to participate in the free, public fall commencement ceremony at 10 a.m. Saturday, Dec. 9, at Beasley Coliseum. PULLMAN, Wash. – Family members and friends packed into WSU’s Beasley Coliseum on Saturday, May 6, where more than 3,000 graduating students received diplomas during the university’s annual spring commencement ceremony. Casey McNicholas, a U.S. Army officer and senior in political science and history, has been selected to carry the College of Arts and Sciences gonfalon during Saturday’s commencement ceremony in Beasley Coliseum. 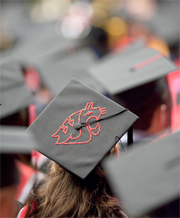 PULLMAN, Wash. – About 3,026 students are expected to participate in Washington State University Pullman commencement ceremonies at 8 a.m., 11:30 a.m. and 3 p.m. Saturday, May 6, in Beasley Coliseum. 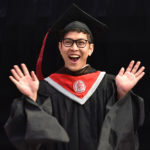 VANCOUVER, Wash. – Washington State University Vancouver will graduate a record 1,014 students at its 2017 Commencement ceremony at 1 p.m. Saturday, May 6, at the Sunlight Supply Amphitheater in Ridgefield, Wash.